This week Oakland Unite was featured in Brenda Payton’s series “Steps Toward Peace.” The article titled “Steps Toward Peace: Oakland Unite provides support services toward violence prevention” highlights the work of Oakland Unite’s Violence Prevention Network Coordinator, Kevin Grant, and Lead Case Manager, Emilio Mena. 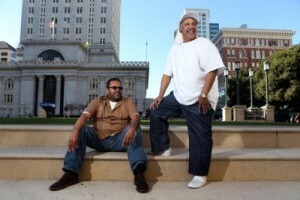 Emilio and Kevin in front of City Hall in Oakland. The article credits the work done by Oakland Unite, and specifically by Kevin and Emilio, as contributing to the decrease in violence in Oakland. To read the entire article click HERE.